Tory wants a provincial budget commitment to match funding in the federal budget. 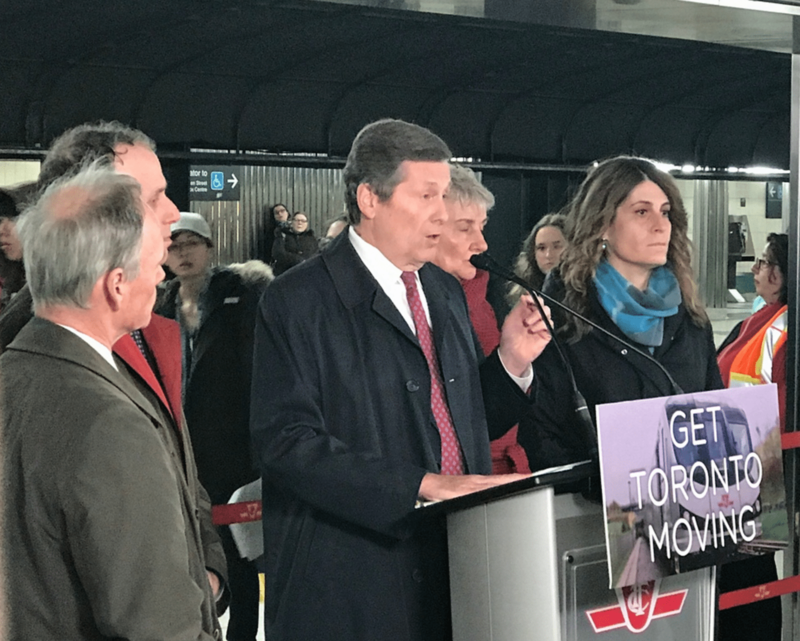 Mayor John Tory held a press conference on a subway platform on Monday to ask the Premier Kathleen Wynne for a commitment of funding for the Downtown Relief Line in the Ontario budget. Photo by Anders Marshall. Mayor John Tory said he would be “flabbergasted” and “dumbfounded” if the provincial government decides to fund a northern extension of the subway on Yonge Street and not the Downtown Relief Line. Tory stood on the southbound platform at Bloor-Yonge station today to speak about the importance of the Downtown Relief Line. He says completing the DRL will be impossible without provincial funding committed before shovels hit the ground. “The relief line must be up and running before expanding the Yonge line further north,” he says. It was a challenging place for a news conference, as trains eased in and out of the station and morning commuters stopped to listen or grab a picture. The federal budget contains a transit infrastructure fund of $20 billion earmarked to public transit projects across the country. The City is expecting to get around $5 billion of that, although the federal government has yet to say how much will flow to where. The DRL has been estimated to cost $6.8 billion. Tory is no stranger to friction with the province. In January, Premier Kathleen Wynne struck down Tory’s plan to place road tolls on the Don Valley Parkway and Gardiner highways.